My dining room was in serious need of some help. 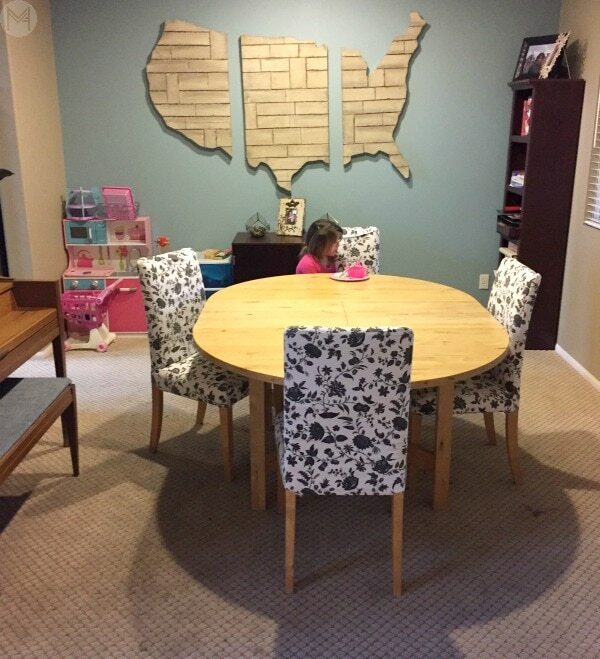 My kids had trashed the carpet… the walls were bare and uninspiring and it was certainly not a happy room to be in, so I decided to give my drab and boring room a modern dining room makeover! 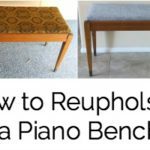 I love how it turned out, my husband does too – here are all of the details on what we did in the space! I’d love to know.. what’s your favorite part? In our experience, carpet in the dining room is a terrible idea – little kids and carpet is not a good combo. So that was the first thing to go. We have lots of different types of wood in this house, so I wanted something with a lot of variation – I also wanted it to hide dust/crumbs/spills etc which it does beautifully ha! I shopped around a lot at many different stores before settling on some laminate flooring at lumber liquidators. We went with the one on the far right. 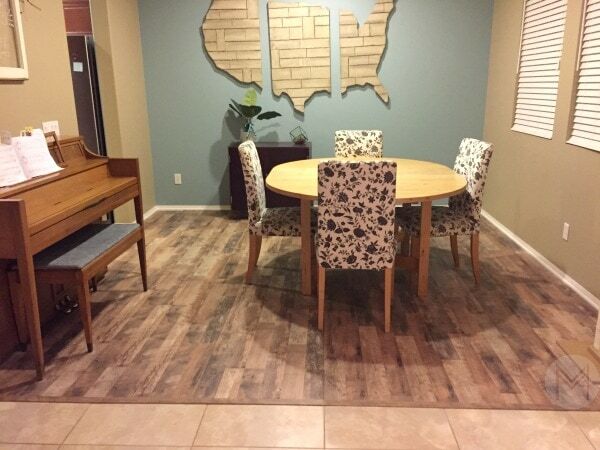 New floors in such a small space is really a small investment for something so much easier to clean and creates a much more stunning dining room makeover! My husband installed it over the Christmas break last year. Our floor came with a pad attached which was nice, but we added an extra quiet walk pad to help with noise reduction. Here is how the room looked after being cleared of kids toys and unnecessary furniture and new floors. Much better, but not particularly special at all. 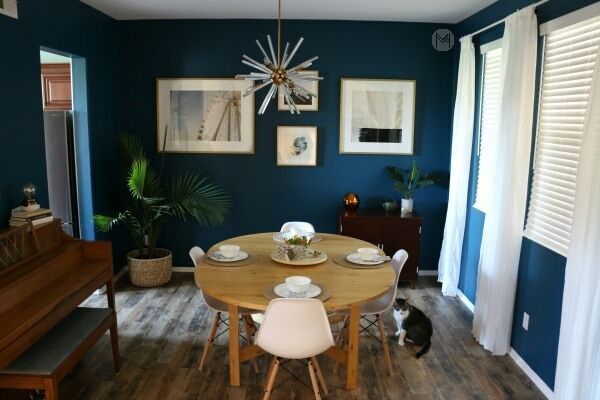 We lived with it like this for several months and it wasn’t until I went to visit my friend Lisha (who has an amazing decorating style) that I was totally inspired to finish up this room. By that point I had a little bit of a money set aside that we could put a little more effort into this room – after all, the biggest expense of this room had already been done in the floors. The next step was to decide on the paint color. I bought several small containers of different brands and finishes to determine the one that I wanted… I will do a full blog post on that, because there are many tips and tricks I learned. I do love the light and bright white wall trend that is so popular right now, but I wanted something different. Also, this room doesn’t get great natural light anyway, so it’s already a little cave-like. So rather than fight that, I decided to go with a more moody vibe ;). 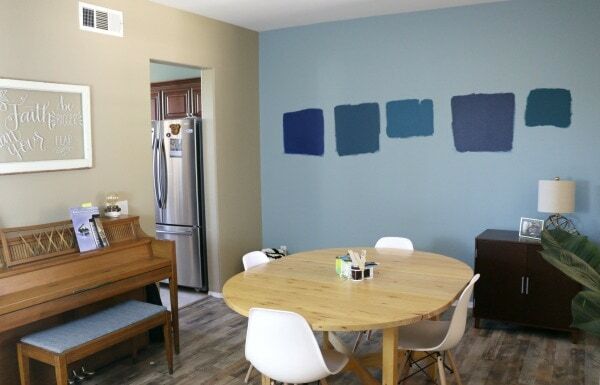 I mean, this is a dining room makeover – let’s make it pop! Speaking of bold paint color… I painted my laundry room black awhile back – HERE it is in case you missed it! 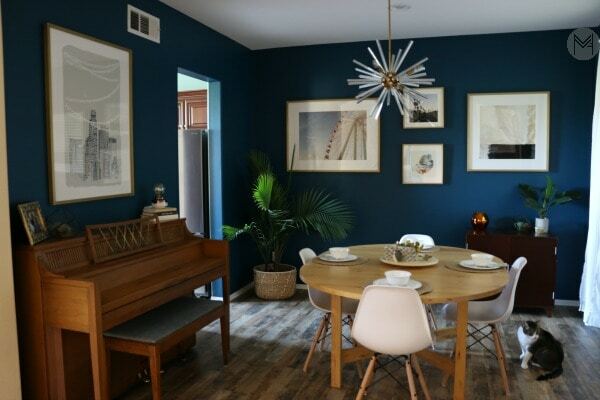 Once I determined the paint color – Benjamin Moore Slate Teal in Eggshell, it was time to hunt for the chandelier. This was no small feet, let me tell you. I looked high and low, called stores, waited for the ones I wanted to come back in stock and spent entirely too much time trying to figure this out! 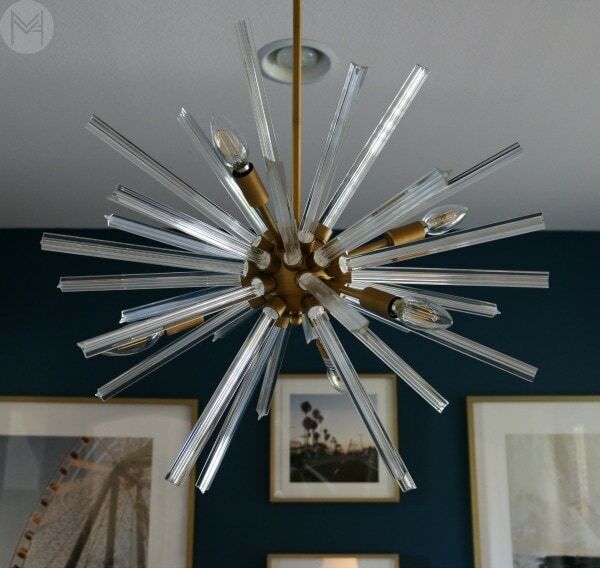 But in the end, I found the perfect one at All Modern, it’s called the Harbin 6-light Sputnik chandelier (looks like it’s out of stock again). It was under $300, came with the bulbs and exactly that old hollywood touch that I wanted in this room. While I was figuring out the chandelier I began searching for the art. In my search I came across Minted, which I thought was more stationary but I discovered that they have some amazing art that was exactly the style I was looking for. 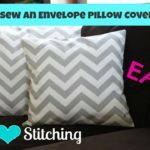 I tried out their art styling service and loved the process – and if you have trouble figuring out art to pick for your home you will love it too! 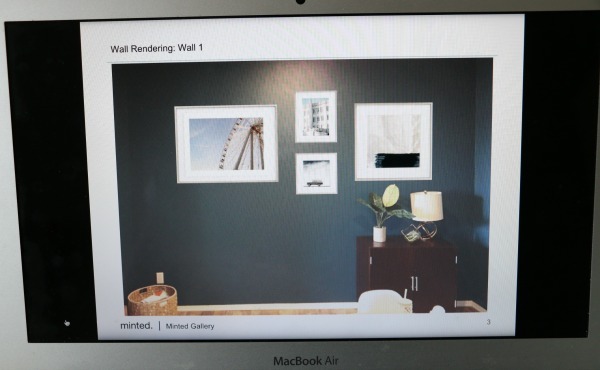 Here is the rendering of the wall art… and you can see what it actually looks like. Pretty cool right?! You have several rounds of revisions to make sure everything fits within the budget you set and the style you are looking for. As you can see, we swapped out the center art pieces for some different choices as part of the process with our stylist Cherie. If you struggle with picking out art… this service (HERE) will be so helpful for you! Floors… check. Paint… check. Chandelier… check. Art… check. The dining room makeover is almost complete, now it’s time for accessories! Curtains and curtain rod, place settings, lazy suzan, and copper light came from ikea. Dining chairs are from amazon. Large palm plant is from Lowes and the smaller plant is fake from Target. Small light on the piano is from Homegoods. I would love to know what you think?!!! What is your favorite part of this room? 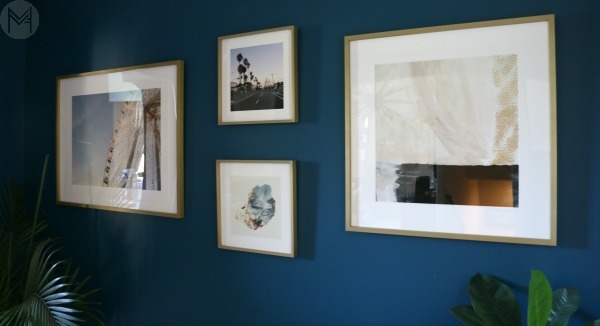 *This post is not sponsored by Minted, but I did receive a discount code to try out the Minted Art Styling Service and a discount code for the art. All thoughts and opinions are honest and my own. All other products where purchased with my own money. 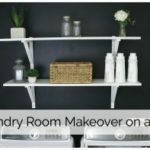 DIY Laundry Room Makeover on a Budget! New DIY Nursery Series Video! My favorite is the wall color! I like color on walls and this one is beautiful. Like the plain white curtains and the chandelier too. Glad you took your time to “find” what you wanted instead of just doing what was “in”. Great job! I love the wall color. I could use the UNited States wall design. What would you need for it if you’d like to get rid of it? Love, love, love that light fixture! Love the new design. The wall color and that fabulous chandelier is my favorite! Job well done! Love it! I especially love the wall art and how it is positioned! 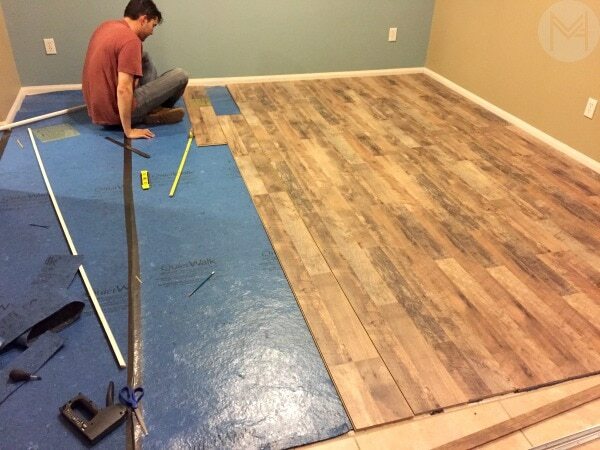 Awesome that your husband was able to do the floor installation! I love the color on your walls ! It all looks fabulous! Thank you Debbie! It was a risk, but I think it paid off!